InterSystems IRIS provides a set of predefined locales. An InterSystems IRIS locale is a set of metadata that specify the user language, currency symbols, formats, and other conventions for a specific country or geographic region. The next section of this chapter provides more details. The locale specifies the character encoding to use when writing to the InterSystems IRIS database. It also includes information necessary to handle character conversions to and from other character encodings. When you install an InterSystems IRIS server, the installer sets the default locale for that server. This cannot be changed after installation, but you can specify that a process uses a non-default locale, if wanted. The Management Portal displays strings in the local language as specified by the browser settings, for a fixed set of languages. You can provide localized strings for your own applications as well. See the article String Localization and Message Dictionaries. This mechanism is available for REST services and Business Intelligence elements. 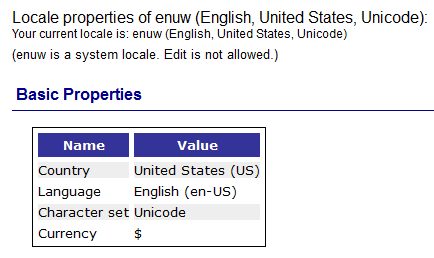 The default character set (the character encoding of this locale), as defined by a standard (ISO, Unicode, or other). Note that InterSystems IRIS uses the phrases character set and character encoding as though they are synonymous, which is not strictly true in all cases. A set of translation tables (also called I/O tables) that convert characters to and from other supported character sets. The “translation table” for a given character set (for example, CP1250) is actually a pair of tables. One table specifies how to convert from the default character set to the foreign character set, and other specifies how to convert in the other direction. In InterSystems IRIS, the convention is to refer to this pair of tables as a single unit. InterSystems IRIS uses the phrase National Language Support (NLS) to refer collectively to the locale definitions and to the tools that you use to view and extend them. For information on accessing and using this Management Portal page, see “Using the NLS Pages of the Management Portal” in the System Administration Guide. InterSystems IRIS also provides a set of classes (in the %SYS.NLS and Config.NLS packages). See “System Classes for National Language Support” in the chapter Customizing the InterSystems IRIS in Specialized System Tools and Utilities. For example, when InterSystems IRIS needs to call an operating system function that receives a string as a parameter (such as a file name or path), it first passes the string through an NLS translation appropriately called syscall. The result of this translation is sent to the operating system. To see the current defaults, use %SYS.NLS.Table; see the class reference for detail. Whenever you read to or write from an entity external to the database, there is a possibility that the entity is using a different character set than InterSystems IRIS. The most common scenario is working with files. At the lowest level, you use the Open command to open a file or other device. This command can accept a parameter that specifies the translation table to use when translating characters to or from that device. For details, see the I/O Device Guide. Then InterSystems IRIS uses that table to translate characters as needed. Similarly, when you use the object-based file APIs, you specify the TranslateTable property of the file. InterSystems IRIS provides the $ZCONVERT function, which you can use to manually translate characters to or from another character set.